Long Beach Bike ambassador Tony Cruz with his Felt FR1 bike. Courtesy photo. It’s not a stretch to guess that road cyclist Tony Cruz is eligible for one of the famous “I Had My Bike Stolen in Long Beach” T-shirts. It’s hard to imagine that a pro cyclist could live in Long Beach for 47 years without getting a bike or two swiped. Now, Cruz, Long Beach’s official Bicycle Ambassador, can wear the Pico Rivera version of the shirt since he’s now had a bike stolen in that town at Streamland Park, between the Los Angeles and San Gabriel rivers. And by “bike,” I don’t mean something like my Schwinn Varsity 10-speed that was jacked in the late 1960s. That was a nice $80 cycle. 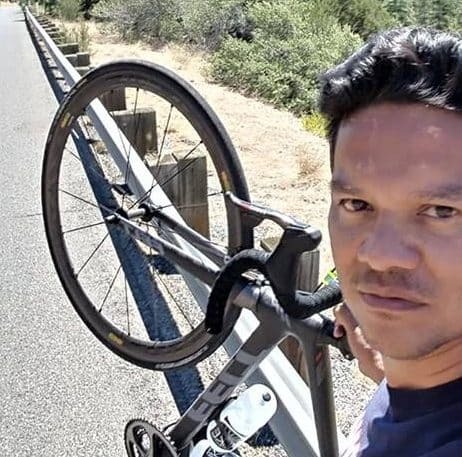 Cruz’s, which was taken early this week, was, to use the description he posted on Facebook, “my old Felt FR1 carbon bike with Sram e-Tap and Mavic Carbon Cosmics.” So, we’re talking about a bike that goes for about $8,000 new, with wheels that will blow the best part of a $1,300 bill for the pair and throw in another grand and change for the e-Tap derailleurs. Either our thieves really know their bikes or they blundered into a financial windfall. Cruz was unavailable for me to help find his Felt because he was out of town on a cycling vacation for the week. The cyclist enjoyed a nice career in the sport for the first six years of this decade, riding for such world-class teams as the U.S. Postal Service, Toyota-United, the Discovery Channel and the BMC Racing Team. He was a teammate of Lance Armstrong for six years and was instrumental in bringing the Amgen Tour to Long Beach. I’m no pro, and I’m certainly not going to talk about “Bike Club,” but perhaps something thrown into the rule book about how to buy and use a good lock might be of some value. If, in your travels, you come upon Cruz’s Felt, probably being pedaled by someone not wearing Spandex, drop him a quick message on his Facebook page.